Actor-turned-politician Shatrughan Sinha today officially joined the Congress, on the Sansthapna Diwas or Foundation Day of his outgoing party, the BJP. As he bid a farewell to the BJP, with which he has shared an acrimonious relationship for years, the lawmaker took pot shots at Prime Minister Narendra Modi and party chief Amit Shah. “In the one-man show, two-man army, everything happens from Prime Minister’s Office… the ministers can’t work freely anyway,” he said. “We have seen how democracy turned into autocracy” he added. Taking a jibe at the BJP over the snub to veteran leader LK Advani, Mr Sinha said, “Advani ji was sent to Mardarshak Mandal which hasn’t held even a single meeting so far. They did the same to Jaswant Singh, Yashwant Sinha… I was even told that I have been a critic and that I will not be given a cabinet post… but my image has been clean.” Calling demonetisation “probably the world’s biggest scam”, Mr Sinha said “It was a mindless decision… Several people died… Modi ji’s mother was in the queue and we were told it was normal. 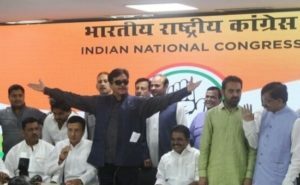 Shatrughan Sinha, 72, is likely to contest as the opposition alliance candidate from Bihar’s Patna Sahib, his constituency of 10 years. © 5885 Bihar GK. All rights reserved. XHTML / CSS Valid.